Feasterville Rotary honors Isabella Mazzoni - Times Publishing Newspapers, Inc.
Isabella Mazzoni was recognized as December’s Student of the Month by the Feasterville Rotary Club at its breakfast meeting on December 11th. She lives in Feasterville with her parents, Colleen and Michael Mazzoni, and siblings Julianna and Marco. Isabella has attended Neshaminy Schools for 13 years, carries a 4.17 GPA and is ranked 61 in her class of 635. She was introduced to the Rotary by Mr. Colin Trickel, Grade-Level Assistant Principal at Neshaminy High School. Isabella’s senior courses are AP English 12, Honors Spanish 4, Honors Physics, AP Psychology, AP Studio Art, Honors Calculus and Concert Choir. She is a member of National Honor Society, Book Club, Concert Choir, Women’s Choir, Gym Night Mural and participates in Gym Night. Isabella’s name consistently appears on the Distinguished Honor Roll, and she has been recognized by “Emergence” at Bristol Borough for the Arts and “Touch the Future Exhibit” at Arcadia University. She volunteers as setmaker at Poquessing Middle School, does babysitting, and works as a cashier at Feeney’s. Isabella enjoys drawing/painting, singing, reading and making memories with friends and family. She is undecided about life after high school, but plans to attend a four-year college in hopes of pursuing a career in the arts. 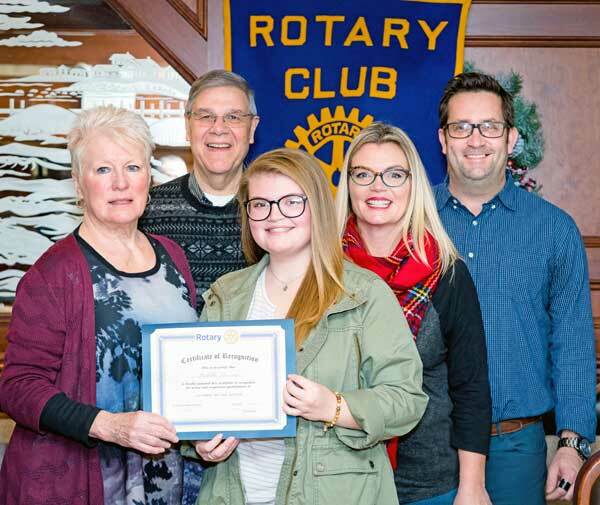 PHOTO CAP: Pictured from left are Gail Chamberlain, President Feasterville Rotary; Bill Wegman; Isabella Mazzoni; and Colleen and Michael Mazzoni.